When we think of moving image art it’s usually film and video works that spring to mind first, but artists like to play and there’s more than one way to make an image move. 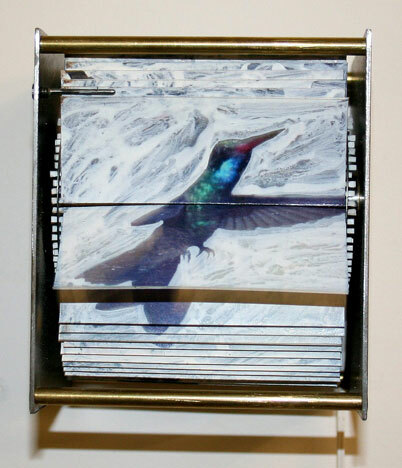 One of the works I’ve enjoyed the most in recent years is Juan Fontanive’s Quicknesse, a simple flipbook device which traps a hummingbird in a loop of hovering. The sound of the work conjures a sense of agitation and urgency; the bird is beautiful, trapped in our gaze. There is something extraordinary about this work. Whether it’s the simplicity of the device or the touching beauty of the image, in which the bird is isolated from its surroundings (the background of the image is painted out in white so that the bird floats), I’m not sure, but it has stayed with me since the first time I saw it. Effectively this is stop motion animation as sculpture. Juan Fontanive has another London show opening at Riflemaker Gallery next month. Can’t wait.